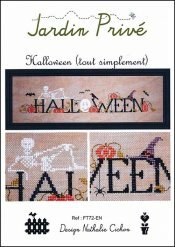 Halloween (Tout Simplement) [J1011] - $9.00 : Yarn Tree, Your wholesale source for cross stitch supplies. Cross stitch pattern by Jardin Prive. Pumpkins, bats, spiders, skeleton....it's "quite simply Halloween!" "Halloween," is stitched in the middle of this design with various Halloween images stitched throughout the word. The skeleton is relaxing on letters "H,A,L,L." Lookout for the spiders as you pick your favorite pumpkin! Have a spooktacular Halloween! Stitch count 191w x 41h. Stitched on #4178 Zweigart Belfast Linen 32ct. Vintage Country Mocha.